PVC, or polyvinyl chloride, provides a sturdy and inexpensive material from which to construct a full size musical harp. Harp-maker John Kovac includes detailed illustrations and templates for creating a PVC pipe at home in his book "PVC Musical Instruments and How to Build Them." While a PVC harp does not offer the exact tone quality of a wood harp, the instrument can produce an expressive and musical sound across three octaves. The PVC harp weighs in at only 9 lbs and does not damage as easily as a real harp, making it an attractive option for many musicians. Cut a 33-inch-long piece from the 5-foot-long 4-inch-diameter thin wall PVC S&D pipe with a saw. This forms the harp's sound chamber. Create the post, or pillar, of the harp by cutting a 34.75-inch section from the 5-foot-long, 1.5-inch-diameter schedule-40 PVC pipe. Cut an additional 2-inch-long piece from this pipe. Create the neck piece by cutting the 12-inch-long, 2-inch-diameter schedule-40 PVC pipe into two pieces, one 4 inches and one 6 inches long. Create the pillar end of the neck by applying a coat of PVC primer to one end of the recently cut 2-inch-long, 1.5-inch diameter pipe and one of the branching Y ends of the 1.5-inch wye. Apply cement over the primer and quickly glue the pieces together. Use a hammer if necessary to securely fit the pieces together. Use the same technique of applying primer and cement to glue the 1.5-inch-by-2-inch pipe increaser-reducer coupling into the open end of the 1.5-inch diameter pipe. Begin shaping the harmonic curve that holds each string at its appropriate tension by cementing the previously cut 4-inch-long, 2-inch-diameter piece of pipe into the open end of the increaser-reducer coupling. Cement the 2-inch-diameter 1/8 bend into place, arching upwards, followed by the remaining 6-inch-long neck piece. Create a downward turn in the neck by inserting the 2-inch-diameter 1/4 bend at the end of the neck. Cap off the neck and create a bridge to the resonator by cementing a 4-inch adapter bushing lip-down, positioned in the 1/4 bend. Cement the remaining 4-inch adapter bushing onto the branching Y end of the 4-inch-by-2-inch wye. This wye forms the base of the instrument. Slide the sound chamber, the 33-inch-long pipe, into the 4-inch adapter bushing that protrudes from the base of the harp. Assemble the remaining frame of the harp by placing a 2-inch-by-1.5-inch flush bushing followed by a 1/16 bend, street 1.5-inch PVC piece into the open end of the wye that forms the base of the harp. The bushing and bend provide a base for the harp's pillar. Insert the 34.75-inch pillar of the harp into the 1/16 bend. Rotate the pillar to create the widest angle between the pillar and the sound chamber. 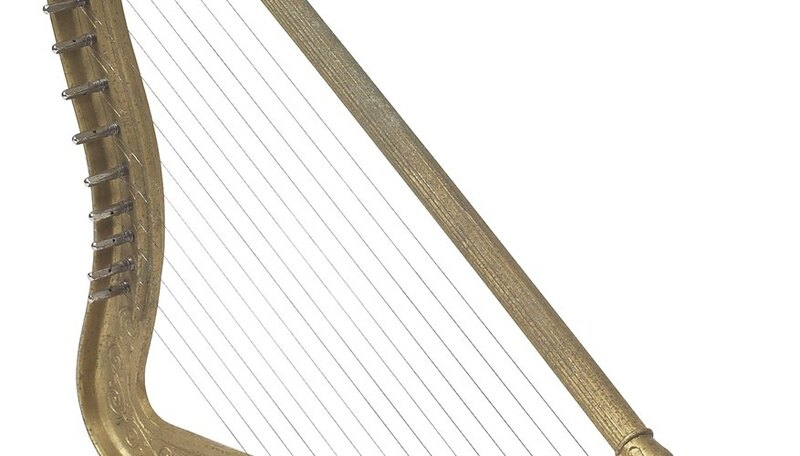 Attach the neck of the harp to the pillar by inserting the open end of the wye of the neck into the 34.75-inch-long pillar. Connect the other end of the neck to the sound chamber by inserting the 4-inch bushing on the neck of the harp into the 33-inch PVC pipe. Mark 22 string holes on the bottom of the harp's neck and the top of the sound chamber with a scratch awl. Mark an additional 22 holes along the neck for the tuning machines. Align this second line with the first. Use John Kovac's template, or experiment to create your own. Drill the holes for the lowest two strings, positioned closest to the pillar, with a 5/64-inch drill bit. Use a 1/16-inch drill bit on the remaining string holes. Drill the tuning machine holes with a 1/4-inch drill bit. Create access holes in the neck by drilling with a 3/32-inch bit into the neck in the shape of a circle. Make each hole as close to the next as possible. Knock the access holes in with a 1/4-inch chisel. Install the 22 guitar tuning machines. Use only one screw placed on the bottom per machine. String the lowest note first in the holes nearest the pillar. Insert each string into the sound chamber and tie three knots in the bottom end to secure it inside the chamber. Draw it up to the neck and through the appropriate hole, then through the shaft of the corresponding tuning machine. Turn the peg of the tuning machine to increase the tension on the string and raise the pitch. Tune the instrument slowly, and retune it before playing.